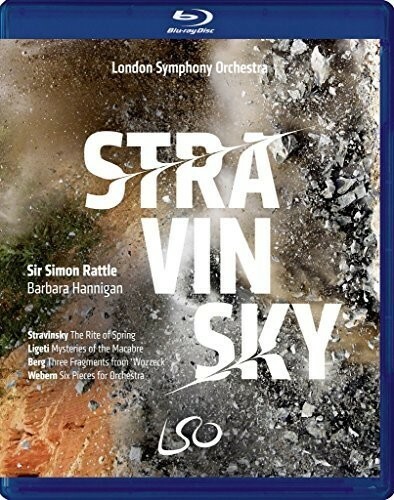 Sir Simon Rattle is joined by virtuoso soprano Barbara Hannigan for a modernist programme that showcases the immense capabilities of the London Symphony Orchestra. At the heart of this concert is The Rite of Spring. Once decried, it is now a cornerstone of orchestral repertoire and considered by many to be the greatest work of the 20th century. Its elemental nature is best summed up by Stravinsky, who, in an unaccustomed moment of humility, said that he didn’t feel he was the composer of the piece, but simply the vessel through which it passed. Sir Simon Rattle says, “I’ve been conducting it since I was 19…it’s one of those pieces that reminds you what the shock of the new is about and it’s still one of the great challenges and one of the great thrills to perform.” To accompany Stravinsky’s magnum opus, Rattle chose music from the Second Viennese School. Webern’s Six Pieces for Orchestra was given a ‘richly expressive and pictoral performance’, while Barbara Hannigan, appropriately dressed in a blood red gown, embodied the role of Marie in three fragments from Berg’s potent opera Wozzeck. As well as the Berg, Hannigan also debuted a now famous version of one of her party pieces, Ligeti’s kaleidoscopic Mysteries of the Macabre. Channeling Gepopo, the crazed chief of police from Le Grand Macabre, in three arias, this display of coloratura pyrotechnics drew gasps as well as laughter from the enthralled audience.